Next week is Halloween (my favorite holiday!) and I am enjoying the fall weather that comes along with it. I have not decorated this year… just not in the mood. But come next week I will be ready for those little (some not so little) trick-or-treaters. Here in Des Moines, IA, kids trick-or-treat the night before Halloween and it’s called “beggars night”. They also tell you a joke! I just hope the weather is beautiful so I can sit outside and hand out candy. 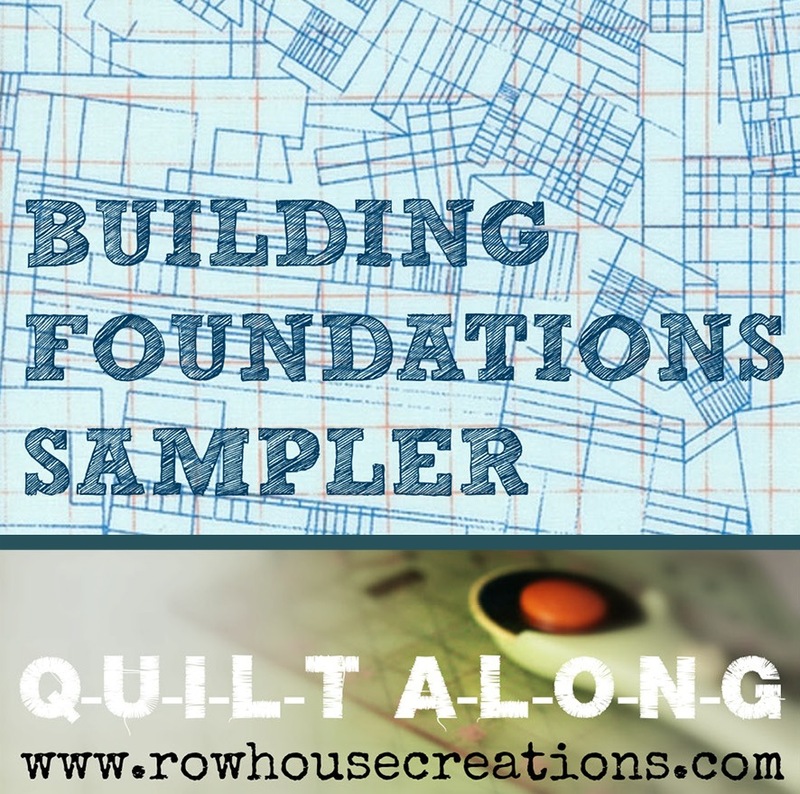 It’s Wednesday, which means it’s time for another block in our Building Foundations Sampler! Background fabric (where green squares are), cut 4 – 2 1/8″ squares. Accent fabric 1 (lt blue in diagram), cut 2 – 3 5/8″ squares and 4 – 2 1/8″ squares. 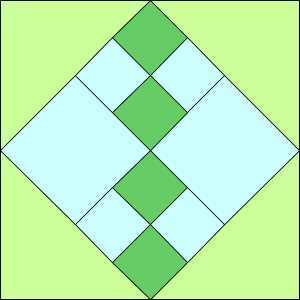 Accent fabric 2 (lime green in diagram), 2 – 5 1/2″ squares, cut in half diagonally. 1. Lay out 2 (2 1/8″) accent squares and 2 (2 1/8″) background squares. Join to make a four-patch. Make 2 four-patch units. 2. Lay out four patch units with 2 (3 5/8″) accent squares as shown in block diagram. Join into rows, join rows. 3. Add Accent fabric #2 triangles to outer edges to complete block. 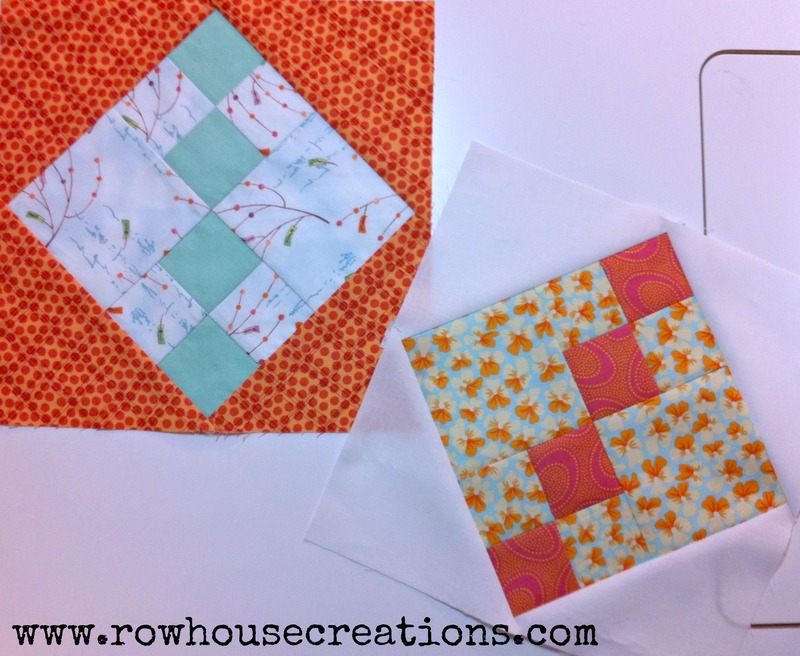 Note: In Doris’s block (on the right) she put her background in the place of accent fabric #3 for a different look.